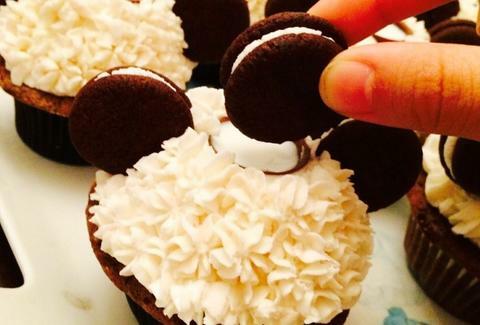 The Internet is packed to the gills with recipes for Oreo cupcakes. Most of them just throw a few cookies into their boxed cake mix -- if you're lucky, they might garnish the frosting with some crumbs. But The Baking Spoon has finally realized their full potential with this recipe for Oreo cupcakes, which includes mini homemade cookies and edible milk cups for dipping. Despite the elaborate set-up, these things are still easier to assemble than Cronuts. For starters, no one's expecting you to handcraft the milk cups. Anna, the brains behind The Baking Spoon, admits she bought dark chocolate cups off Amazon, so go ahead and order a bunch of those. Once you've gathered all the other ingredients, you're going to prepare an Oreo-blasted batter for the cupcake base. While those are in the oven, you can get to work on the vanilla buttercream frosting and mini cookie batter. After everything's been properly blended and baked, you'll frost each cupcake, nestling a dark chocolate cup filled with milk in the middle of each. Two mini cookies get afixed to the sides, and pretty soon you'll have an army of Mickey Mouse-esque Oreo cupcakes. It's up to you how you want to consume these confectionary mountains -- just don't try to twist off the top. Kristin Hunt is a Food/Drink staff writer for Thrillist, and thinks these cupcakes are an excellent source of calcium. Follow her at @kristin_hunt.